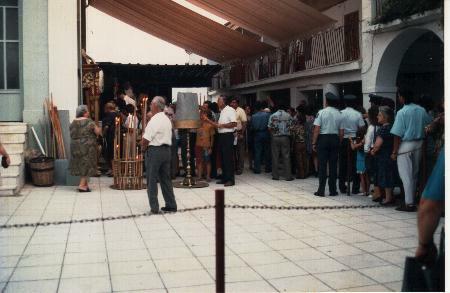 On August 14th of 1991 I was in Patras, Greece staying in my grandmothers home preparing for an all-night adventure to experience as much as possible the feast of the Dormition of the Theotokos for the first time in Greece. Growing up in America, the feast of the Dormition was only fairly important to me mainly for two reasons: first, my home parish was one of only two parishes in the Boston area that celebrated the feast with a decorated Epitaphios and the singing of the Lamentations, and second, because it was the nameday of both my parents - Panagiotis and Panagiota - and we usually had a celebration in my home on that day with family and friends. But in Greece the feast offered a new experience for me and brought it to life for the first time in a very special way. It also helped that this was the first time I ever kept the fast for the whole fifteen days, and it was the first time I went to Confession. Throughout the first fifteen days of August I was traveling to many shrines throughout mainland Greece and the islands, and it seemed everywhere I went there was some place with a story associated with the feast and the Virgin Mary that was highly honored by the local people. Even the most remote villages, I was learning, had their own particular story that played a major role in the life of that village. And there were so many places that had special celebrations on August 15th itself, that I felt hard-pressed deciding which place I wanted to celebrate on that particular day. Seeing that I was only 15-years old at the time and by myself in Greece with family living in Patras, my choice was limited to attend the famous all-night vigil at Girokomeio Monastery with my grandmother. My Uncle Niko also offered to take me to a remote village about two hours away in the mountains of Kalavryta following the vigil to attend a morning Divine Liturgy high up a mountain in a chapel that only had a Divine Liturgy once a year. It would be a long night, but I took him up on the offer trying to take in as much as I could that summer. 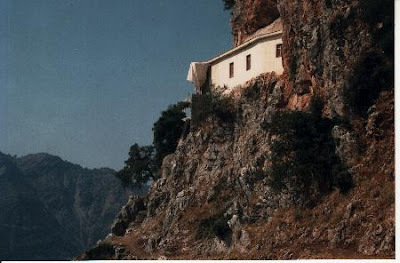 Girokomeio Monastery is one of the oldest functioning monasteries in Greece, dating back to around the tenth century. It is called "Girokomeio" because the Monastery used to run an old age home in Byzantine times. The Monastery itself was built over an ancient pagan temple dedicated to Artemis, which is one reason why the Katholikon of the Monastery is dedicated to St. Artemios. The other reason is that St. Artemios, who was the general of St. Constantine the Great, is said to have come to Patras by order of Emperor Constantine in the fourth century in order to transfer the relics of the Apostle Andrew, who was martyred in Patras near this Monastery, and bring them to Constantinople. 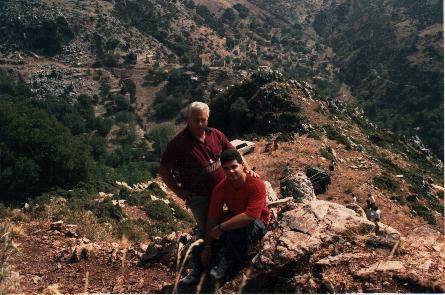 My uncle dropped off my grandmother and I at Girokomeio Monastery in the high hills of Patras in the evening around 6:00pm and the vigil was scheduled to end around 3:00am. This was to be my first all-night vigil and I didn't know what to expect as far as my stamina was concerned, but I was determined to pull through. I had attended this vigil once before when I was 7-years old, but it was only to drop off my grandmother and venerate the miraculous icon of Panagia Girokomeitissa, but then I left with the rest of my family except my grandmother. This was the first year my grandmother would attend the whole vigil with someone else. The Monastery was full, literally thousands of people. My grandmother settled with a spread blanket somewhere in the courtyard, where people could listen to the Service through a sound system connected throughout the Monastery grounds. Most of the time I spent walking around the Monastery people-watching and observing what was going on, but I did spend about four hours within the packed church for prayer. I could only sit for so long with my grandmother before I just wanted to walk around and take in all the excitement, such as when a Jehovah's Witness came around and began yelling at the top of his lungs for all the Orthodox who were waiting in line to light a candle and venerate the icon to repent of this "abomination". My Uncle and I had planned to meet at 3:00am at the entrance of the Monastery so we could drive to our next destination. After dropping off my grandmother at her home we set off for about a two-hour drive in the early morning hours through the mountainous roads with many twists and turns in order to attend the once a year Divine Liturgy at 7:00am. It should be noted that my Uncle Niko is notorious for two things - his loud snoring and his habit of falling asleep while driving. After dropping off my grandmother he told me he was wide awake, but brought along a gallon of water just in case he did get tired. And the water was not for him to drink, but for me to pour on him every time he felt the need to fall sleep while driving along the mountainous roads with many twists and turns - and no guard rails! I was pretty tired after the vigil and hoped to grab a nap in the car, but everyone warned me that it was out of the question and that I was to keep my Uncle awake at all costs. Not a half hour passed before my Uncle started to doze off. I began to wonder if this whole thing was a good idea. I tried talking to him, but that only brought us so far. It came to the point where I had to start pouring water over his head to keep him awake, and he would yell at me to "Keep pouring!" I didn't realize his problem was so serious and that our lives depended on me staying awake in order to keep him awake. Up in the mountains we had to even stop at a fresh water spring to fill up the gallon of water, because we had run out. I forget the name of the village we were going to, but we arrived safely around 6:00am, and I was tired. This village was about two villages away from where my Uncle had a second home, so he had heard about this church from the locals. The history of this church goes back to World War 2 when German soldiers marched through the area. For some reason they went on a rampage and burnt one of the remote villages mid-way up this mountain. In this village was a church which they destroyed, and there was in particular an icon of the Virgin Mary which they took with them a little higher up the mountain to a cliff. When they came to the cliff they decided to fool around and profane the icon, cutting out the eyes with their knives, and it is believed their intention was to throw the icon off the cliff of the mountain as a final desecration. The villagers meanwhile noticed that a long time had passed and had seen no German soldiers return from the mountain. No one had seen them walk back the only path that leads there. They went up to the cliff where they were last seen and they saw the eyeless icon of the Panagia on the ground, but no soldiers. When they looked over the cliff, they saw the soldiers dead at the bottom of the mountain. It seems that their plans had reversed on them. A chapel was eventually built there by the locals to house this icon and commemorate this miracle and it celebrates every year on August 15th. When we arrived that morning we could only drive about half way up the mountain and the rest we had to walk up along a dirt road. On the way up we came across the village destroyed by the Germans, and to my surprise it was still destroyed with no effort made at its restoration. 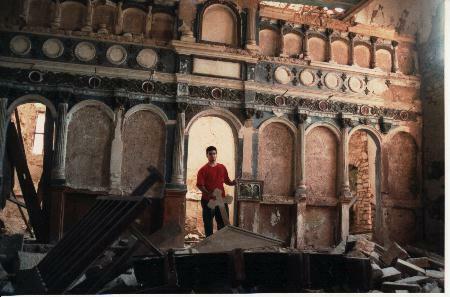 Even the church was still in a state of destruction. When I walked inside it was bare of its icons, except one which I found on the ground and placed near the altar area. We continued along and finally reached the church, which was a lot higher than I thought and literally built on a cliff. We venerated the holy icon with no eyes and stayed for the Divine Liturgy. We then left for my Uncles village home and after a long adventurous night took a long nap the rest of the day.